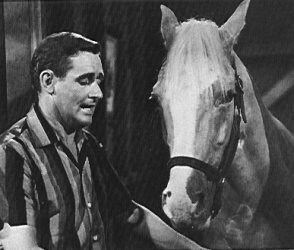 Woke up this morning to the news that the actor Alan Young who played the bumbling owner of the talking horse as Wilbur on the popular TV comedy show “Mr. Ed,” has died at the age of 96 in Woodland Hills, California. Why am I writing something about this? Well, even though I never met Alan Young the news was a little personal. I remember as a kid going to the Hollywood walk of fame with my parents and seeing my name on that sidewalk. It made me feel special and sort of important. Those of you who know me would agree of course. Right? Laugh out loud! My parents even bought me a framed picture of his name “Alan Young” in a star. Waking to this news this morning immediately got me thinking. The power of a name. The power of my name. The power of your name. We identify with our name. It means a lot. It’s something that most of us really never think about. At least very very seldom. When having kids we do however, when thinking of a name for our children search the meaning of that name. It’s actually a really big business. Hundreds of books have been written about the meaning of names. Do you know what the meaning of your name is? If not, look it up today. I think you’ll get a kick out of it and it will make you ponder and think. I’ve attended many conferences over the years on Internet Marketing or Info Marketing. As a matter of fact I’ve gone to one in particular several times by Ken McArthur. He the author of “Impact” How to Get Noticed, Motivate Millions and Make a Difference in a Noisy World. He’s an all around great guy and a friend of mine. His main invent is The Impact Event. Check it out! The reason I share this is because often at these conferences the speakers make a emphasis on getting your name and business or what you have to offer out there for the world to see. And in particular try to get your name on the first page of a Google search. That’s where my frustration came in. Because of the Actor Alan Young, haha! He dominates that name on a Google search. My name which is associate with this blog is buried way back there in the search pages. My son, who’s name is also Alan Young shows up before me (which makes me stoked) because of his skateboarding career and adventures around the world. Have you given your name a search? Try it and see if it comes up. It can be fun. Want to close with these thoughts. This news today about the passing of the Actor Alan Young got me thinking. The power of your name. What Impact am I having in this world? What legacy will I leave when I die. What will be written on my tombstone? And I ask you today, “What Impact are you having? What will your legacy leave behind.? All external expectations, all pride, all fear of embarrassment or failure—these things just fall away in the face of death, leaving only what is truly important. We’ve got this. Let’s go make an Impact today in this world! Alan your insight is right on. In the end our personal impact is what matters most. Having impact is more then a conference or meeting. It’s taking action for the good of others. You have the right heart and mind and you are making a difference Alan. Thanks ! Bobby, Thanks so much for your words of encouragement. The work you are doing and impact you are making across America is incredible. Looking forward to helping spreading the word/news. And looking forward to hanging with you a few days soon doing some planning strategy together. Thanks Bobby! We named you well! Really enjoyed your article.. keep the good thoughts coming !!! Is a husband, father, minister, blogger and co-author with New York Times best selling author Joel Comm. He's the Director of Agape International (Agape1040.com) for the Indian Sub-Continent. Has gone through the school of hard knocks, like most of us. Alan is passionate about reaching the un-reached and motivating others to fulfill their God given cause. He loves hanging out with family and friends, the outdoors and surfing.